Simple controls and over 10 minutes of loop time make this a great option for smaller events and practice. Ammoon is perhaps an underdog brand, but their pedals are absolutely great, especially if you’re looking for cheap ones. 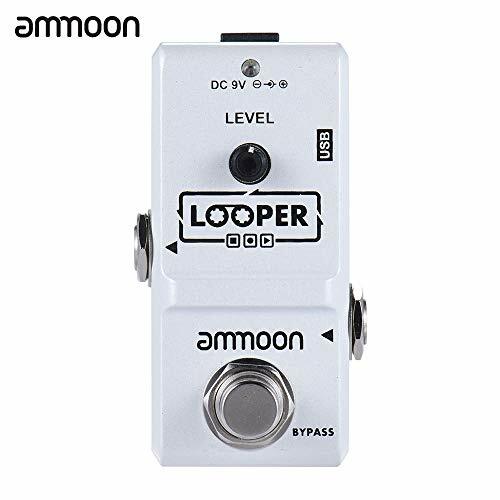 We’re introducing the AP 09 looper pedal from Ammoon’s Nano Series. We’ve strong reasons to believe that this is one of the best budget looper models on line. First and foremost, it’s exceptionally easy to use. Apart from that, this pedal provides excellent audio quality and leaves a very small footprint. It’s compact, and could easily fit into virtually any guitar pedal rig. The first notable feature of AP 09 is its miniature size. This pedal is made of high-quality aluminum alloy which is capable of surviving quite some abuse. You can record guitar lines up to ten minutes, unlimited overdub’s at your disposal, but you’ll also be able to make use of the redo, undo and delete features. Another great feature of Ammoon’s AP 09 is the durable chassis. Namely, the casing of this loop pedal is made of premium quality, very sturdy materials, and you can rest assured that it was built to last. It’s exceptionally easy to use due to one-touch button operation, and there’s only one knob that adjusts the level (output volume). There’s also the ‘true bypass’ button which makes the pedal override other effects in the line. The sheer simplicity of AP 09 makes it one of the best budget loop pedals you could find on the market. It has a simple outfit of settings and apart from being very easy to use, it’s very reliable by a long shot. Being so small and performing excellent sonically, it’s great for band practice, home practice, studio work, and even live performance. The simple, one-touch method of operation is the reason why many live musicians favor it over other, more complex models. Due to its small size, this pedal works great for guitarists that have multiple pedals in their rig. Also, the one-touch button operation means that you can set it up before the gig starts and not needing to dabble with the controls if you intend to use it for live performance. What’s more, the one-touch operation makes it absolutely amazing for live acts. The beginner-friendly design is a huge plus, especially when combined with superb affordability. The only features that you’ll actually need some time to figure out if you’re new to the guitar are redo and undo. There are no real drawbacks to it as a matter of fact – it’s a simple, plain, decently cheap loop pedal, and we encourage you to give it a shot if you’re not looking for anything too specific. On another hand, virtuosic musicians who need more than 10 minutes of loop time, and generally people who want to customize their sound a little better should perhaps skip this pedal. What AP 09 brings to the table is an excellent sonic performance at a price that is more than just approachable, so keep in mind that this is not a professional pedal per se.